Forge Motorsport Dump valve for the 1.2 and 1.4 TSI engine 2015- Product Description The Forge Motorsport dump valve for the 2015-on 1.2 TSI engine codes CJZA, CJZC, CJZD, CYVB as found in the Skoda Fabia, Skoda Octavia, VW Golf, VW Polo, Audi A1, Audi A3, Seat Ibiza and Seat Leon. Audi A1 1.2 Tsi 2015 Onwards. Audi A1 1.4TSI 2015 Onwards. Audi A3 1.2 Tsi 2015 Onwards. Audi A3 8V 1.4 TSI 2015 Onwards. Skoda Fabia 1.2 Tsi 2015 Onwards. Skoda Octavia 1.2 Tsi 2015 Onwards. Seat Ibiza 1.2 Tsi 2015 Onwards. SeatLeon 1.2 Tsi 2015 Onwards. SeatLeon 1.4TSI 2015 Onwards. Volkswagen Golf MK7 1.4TSI. Volkswagen Golf Mk7 1.2TSI. Volkswagen Polo 1.2 Tsi 2015 Onwards. 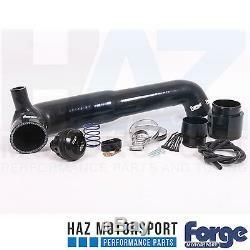 Please note this kit is only compatible with models that do not have a standard turbo mounted diverter valve. Earlier models that have a turbo mounted diverter valve as standard require the kit with part number FMDVA1TSI. The 1.2 and 1.4 TSI doesnt have a dump valve from the factory, so this product allows you to have the traditional dump valve noise between gear changes and when letting off the gas pedal. It wont bring on any check engine lights and the car will drive just as before. This kit totally replaces the plastic pipe from turbo to manifold with a silicon hose (available in a choice of colours), and everything else you need to install the valve is included in the kit together with full instructions. 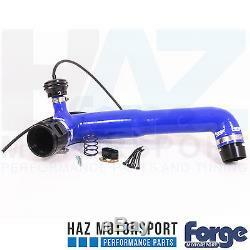 Unlike other valves on the market the Forge valve will not bring on any check engine lights. The Forge silicone hoses in this kit have been designed to include an expensive inner liner of modified silicone known as Flurosilicone. This means the hoses are suitable to be used with modern long-life coolants, Organic Acid Technology coolants O. The construction of the hoses has been engineered to exceed that of the OEM fitments, and will enhance any engine bay both technically and aesthetically. 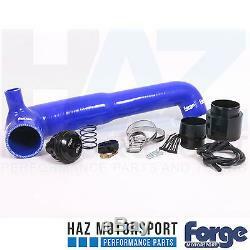 The use of a Flurosilicone liner ensures that Forge silicone hoses are the clear market leader. The item "Forge Motorsport Dump valve For Volkswagen Audi Seat Skoda 1.2 / 1.4 TSI 2015" is in sale since Tuesday, August 1, 2017. This item is in the category "Vehicle Parts & Accessories\Car Tuning & Styling\Air Intake & Induction\Dump, Bypass & Blow-Off Valves". The seller is "haz_motorsport" and is located in GB. This item can be shipped to United Kingdom, Austria, Belgium, Bulgaria, Croatia, Cyprus, Czech republic, Denmark, Estonia, Finland, France, Germany, Greece, Hungary, Ireland, Italy, Latvia, Lithuania, Luxembourg, Malta, Netherlands, Poland, Portugal, Romania, Slovakia, Slovenia, Spain, Sweden, Australia, United States, Canada, Brazil, Japan, New Zealand, Israel, Hong Kong, Norway, Indonesia, Malaysia, Mexico, Singapore, South Korea, Switzerland, Taiwan, Thailand, Saudi arabia, South africa, United arab emirates, Ukraine, Chile.